It was with great secrecy that researchers of the UFO phenomenon in the region undertook their investigations into a case that is at first blush very striking. 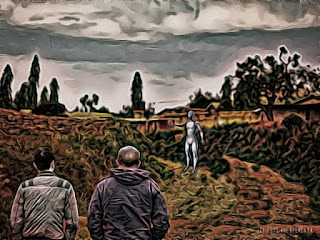 According to members of the Fundacion Argentina de Ovnilogia (FAO) there are witnesses who claim having encountered a humanoid in the morning hours of this past Monday between Ensenada and Punta Lara. "Breaking News! An encounter with a humanoid in early morning hours took place between the locality of Ensenada and Punta Lara (Buenos Aires) with several witnesses. The case is under investigation." This was the brief message disseminated late Monday by renowned specialist Luis Burgos, who has spent his entire life spearheading such investigations. Having contacted 0221.com.ar, the expert limited himself to cautiously reporting that research is barely starting and that there are no further details to provide beyond the information provided. "We have to wait, because research has only just begun. We need time. It's necessary to close a few loopholes," he said. Furthermore, Burgos took the matter seriously, cautioning that the "witnesses were highly reliable." Last year, this website had already explained one of his hypotheses aimed at explaining the major UFO wave that took place in the area throughout 2018. All of this stemmed from last September's event in an empty field outside La Plata, when witness Cristian Yaon recorded the transit of a strange craft in broad daylight. We are dealing with the "Decimal Hypothesis", a matter of great relish for UFO researchers in the city, corroborating their forecast in 2017: that there would be a major increase in unidentified flying object cases in the skies, which would trigger in turn unexplained manifestations. "Despite the fact that 2016 and 2017 were very, very poor in sightings, using the two great [UFO] waves of 1968 and 1978 would suggest a saucerian impact upon Argentina once more. We must be mindful, because a new wave brings with it a series of situations of all sorts in the heavens, water and earth," they had warned at the time, something which finally came to pass in 2018. Furthermore, "statistics on the phenomenon suggest that every time a UFO flap occurs, all manner of events come about: sightings, mysterious impressions found in fields, humanoid sightings, photo and film recordings, mysterious skyfalls, explosions in the heights, undersea objects, etc. In 2018 we also find mutilations, which go hand in hand with saucer reports. For the time being, our decimal hypothesis stands firm." What does the hypothesis state? Using FAO's database as its support, it is based upon two basic points: First that a considerable part of the phenomenon - between 40 and 50 percent of cases - returns to the scene of the events. Secondly, out of these 'repeaters', a significant portion occurs in ten-year cycles. For example, a UFO reported at a certain place in 1968 will return to the sighting location in 1978, 1988, 1998 or 2008. And this is what happened last year. Now, only 22 days into 2018, the mystery has appeared yet again. The case involving an alleged close encounter of the third kind being studied at this moment between Ensenada and Punta Lara can perhaps be related to this theory, although it is still too soon to draw any conclusions.